Andrew Kitzenberg lives on Laurel Street, in Watertown, Mass. On Friday morning, just before 1 a.m., he heard a series of pops from outside his window. The Boston Marathon bombing suspects, Tamarlan and Dzhokhar Tsarnaev, were engaging in a wild shootout with police. Kitzenberg's Twitter account was essential reading that confusing night, and he's now published a series of photos taken from his window. Kitzenberg's pictures, shared on his website OnHand, are dark and blurry. They're also terrifying and illuminating, and answer a number of questions. This photo, and the one above, show the Tsarnaevs huddling behind the front of the SUV that they had hijacked earlier in the night. The car at the left also belonged to the suspects—they had arrived on Laurel Street separately, something first revealed on Saturday. The shooters were also driving the green sedan on the left. They had the back passenger door open and were going back into the car where they had additional supplies (assumingly, more ammunition and explosives). They also had backpacks at their feet where they also had additional supplies. That looks like just two vehicles. And sure enough, on Sunday Watertown's police chief confirmed that police had surprised the suspects before having time to set up a cordon. "Quickly we had six Watertown police officers and two bad guys in a gunfight," he said. In the photo below, Kitzenberg has circled a pressure cooker bomb that the suspects threw at police moments after the picture was taken. The use of this explosive created an enormous cloud of smoke that covered the entire street. While the street was still cloudy with smoke one of the brothers started running down the street towards the officers, while still engaging them in gunshots. As he got closer to the officers, within 10 -15 yards of them he was taken down. From my vantage point I did not see whether he was tackled to the ground or brought down by gunshots. 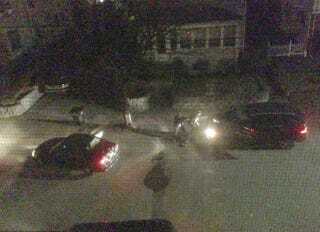 As Tamerlan Tsarnaev ran toward police, Dzhokhar got back in the SUV and drove directly at them. In this photo, Tamerlan is circled, lying in the street. The SUV accelerates toward him. The SUV side swiped both cars taking out doors and windows and ultimately broke through the vehicle barricade and continued driving west on Laurel St.
Kitzenberg has plenty more photos of the incident and the aftermath at his site, including the aftermath of the IED explosion, and a bullet hole through his wall and desk chair.